The image of the Temple of Augustus on the sestertii of Caligula is among the most beautiful architectural motifs found on Roman coins. In its upcoming auction, Numismatica Genevensis is offering the finest known specimen of this fascinating issue. PIETAS. This is the description of the female figure on the front of one of the finest sestertii of Roman numismatics. The goddess sits on her throne with modestly concealed hair and a patera in her right hand, prepared for the sacrifice. She represents Caligula’s personal devotion and, as commissioner of this issue, the reverence Caligula must have had for this divine being. Wait a second… Caligula?? Wasn’t he the crazy ruler who tried to have himself worshiped as a god during his lifetime? Something can’t be right! On this coin he presents himself to us in the role of a devout priest who leads the sacrifice before the Temple of Augustus. This fantastic example of a well-known bronze issue of Caligula is estimated at 100,000 francs in the upcoming Numismatica Genevensis auction, which will take place on November 27 and 28, 2012. This is without a doubt the finest known specimen of this issue. No Roman would have disputed the fact that humans themselves carry a glimmer of godliness within. They would worship this internal godliness at their home altar and identified it as ‘genius.’ The genius (the word ‘gens,’((family)), gender is concealed within) was the guiding spirit of a family, embodying its strength and ability to always regenerate itself. Slaves took oaths to the genius of their master. As early as the year 30 BC, Augustus allowed the senate to issue a decree that before every public and private feast, the genius of Augustus be venerated through libation. Outside of Rome, Augustus didn’t have any problem having his divine honors recognized and acknowledged. We know of a civic temple in Puteoli and one in Neapolis (Naples), not to mention the temples in Pergamum and Lugdunum (Lyon) that were established in honor of Rome and Augustus. In contrast, the godly Augustus was first venerated in Rome only after his death. To this effect, Augustus’ successor, Tiberius, delivered his great speech before the senate, opened his testament, and let the senators talk of nothing else but the honors that would be bestowed upon the deceased. Among these honors was the ritualistic cremation on the Campus Martius. Afterwards, a former praetor testified on oath that he had seen the image of the cremated ascending to heaven, and with that, Augustus’ divinity was more or less officially confirmed. Later, it is said that an eagle was released from the pyre at the right moment to fly towards the heavens. Augustus had been established as a god, in any event, and Tiberius had a temple built for him between Palatine and Capitol, although it wasn’t actually completed under his reign. Instead, it was Caligula who had the opportunity to inaugurate the temple in the year 37 AD. For several consecutive years, Caligula had splendid coins issued of this occasion, coins which depicted him at the sacrifice before his deified ancestors. The young Octavian had already created propaganda from this theme during the Civil War: the young ruler as descendant of the deified. The reverse of the coin shows an image of the Temple of Augustus, which, in the year 69 AD, had already gone up in flames during a period of unrest. We can see the front, festively adorned with garlands, and supported by six Ionic columns; the tympanum is decorated with figures and above it there are figurative acroteria affixed as a roof finial. Before it stands Caligula, his head piously covered to convey his reverence in the presence of the divine. From the left, a victimarius leads the bull that is to be slaughtered on the burning altar. A small assistant stands behind the emperor holding a patera. Cameo depicting Emperor Caligula with two horns of plenty and the Goddess Roma. 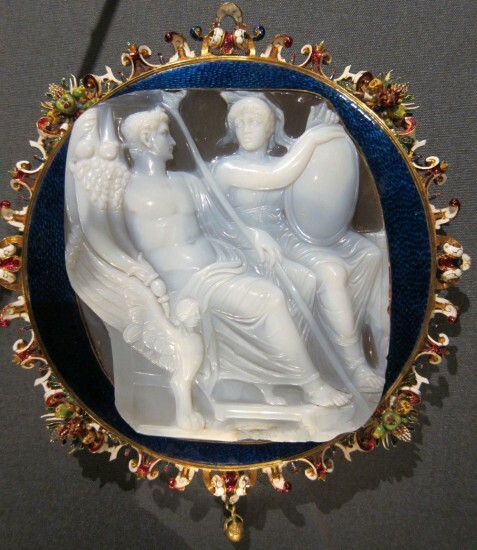 Two-layered Sardonyx; 17th century mounting. Kunsthistorisches Museum Vienna, Inv.-No. IXa59. Photo: KW. A God Offered up for a God? How does this devout religious service fit with the image of barking-mad Caligula? Well, we’ll just come right out and say it – according to recent findings, it’s possible that Caligula was not nearly as crazy as the senators liked to portray him. It’s true that he demanded that in some provinces his effigy be worshiped alongside established gods in the large temples. Augustus had already done this. That Caligula had also considered this for the Jewish temple in Jerusalem may have more to do with a cultural misunderstanding than an actual need to do something out of the ordinary. He also retracted this decision after he had been enlightened as to the consequences of his behavior. For Rome, however, there are only two authors who give accounts of Caligula’s efforts at deification, Cassius Dio and Suetonius. They tell vividly of temples, cults and priests; they offer many details, but unfortunately not one single inscription can confirm what they’re passing on to us. Even the authors Seneca and Philon of Alexandria, who were historically much closer to the time, know nothing of Caligula’s life ambitions to be put on a level with Zeus. Taking another look at the numismatic evidence, one can assume that even Caligula fell victim to the senatorial falsification of history – at least with respect to his aspiration to be worshiped as a god in Rome. Why did Caligula come off so badly in the historical narrative? The explanation is easy to understand – history was written by senators, and senators were committed first and foremost to their standing, and then to the truth. The senate had bent the law considerably for Caligula’s ascent to power: the testament of Tiberius, in which Tiberius Gemellus was appointed as co-regent, was declared as invalid for the benefit of Caligula. And now the senate found itself confronted with the fact that the selection, in hindsight, had proven extremely unfortunate. Caligula really enjoyed humiliating senators! This had to be explained. And what better way to explain it than with a peculiar illness that had destroyed the emperor’s mental state? And in antiquity, a definite sign of craziness was the hubris to want to be a God. Without proper evidence for this, a good storyteller would have had to make it up.